TRAT: At least one Thai tourist died this morning (June 4 ) after a building at Siam Beach Resort in Koh Chang, Trat province, collapsed following heavy rain. The victim was killed instantly while sleeping while another six people, including a child aged 2-3, were trapped under the debris. 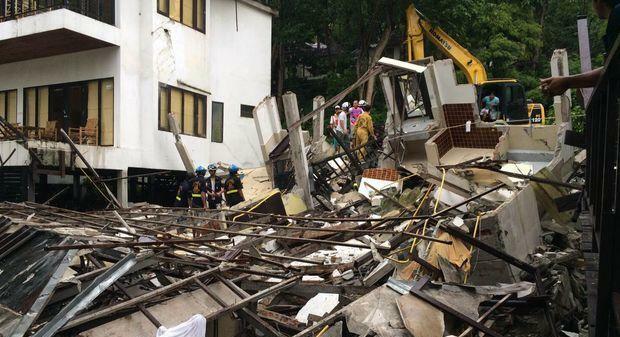 The two-storey building of the hotel in Koh Chang district collapsed at 7:30am, police said. The four-room structure was on the beach with its back against a hill. Heavy rain had caused the soil in the area to subside. The cause of the incident could have been substandard construction, police said. Pol Col Arwat Piboonsawat, chief of Koh Chang police, said he had asked rescue workers, local administrative officials and villagers to help with the rescue efforts. A group of rescue workers in the province said when they reached the scene, they first tried in vain to use stretchers but cement beams were on top of the debris. They had to bring in backhoes to lift the beams first before the victims could be rescued, Thai Rath Online reported.